We are now approaching my favorite time of year – summer! I love spending long nights outside with friends in the summer, enjoying the warm breezes and stars. It is my happy place! 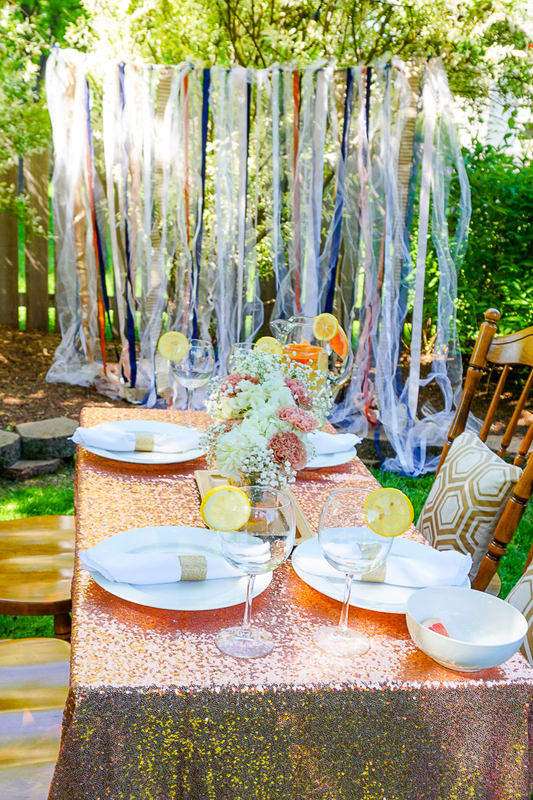 So of course I am already starting to plan fun summer parties, like this outdoor dinner party! 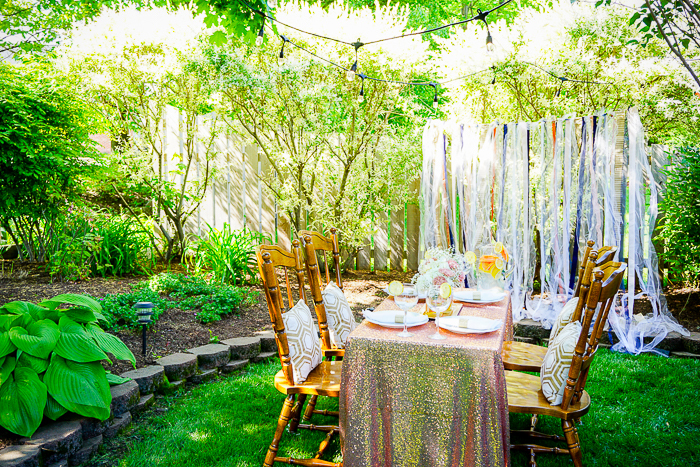 I’m sharing some ideas for throwing an easy outdoor dinner party that your friends will never want to leave. I truly believe this is the most important step to take an outdoor dinner party to the next level! The perfect lighting sets a beautiful tone to the event, inviting people to linger around the table longer. It also makes a statement! My favorite part about this party set up was watching how the whole look changed as the sun set and the warm glow of the lights increased. It was really lovely. Enbrighten Café Lights by Jasco are so easy to hang and enlighten the party perfectly. 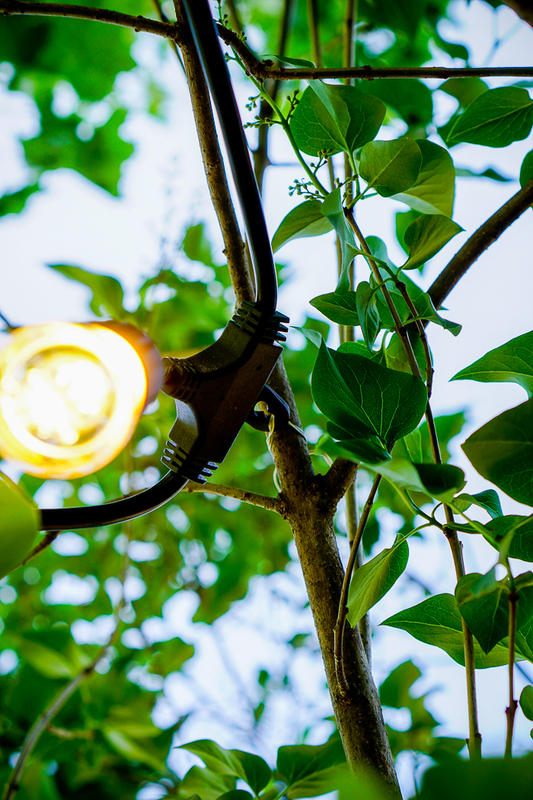 Plus, you will find them in a variety of sizes while all being LED, energy efficient, weather proof and impact resistance. They are built for continuance outdoor use so these would make a great addition to your outdoor pergola or deck. When stringing lights for my own outdoor dinner party, I used long twisty ties to attach the strand of lights to the trees and bushes. Twisty Ties are great because they offer adaptability and no harm to your plants. 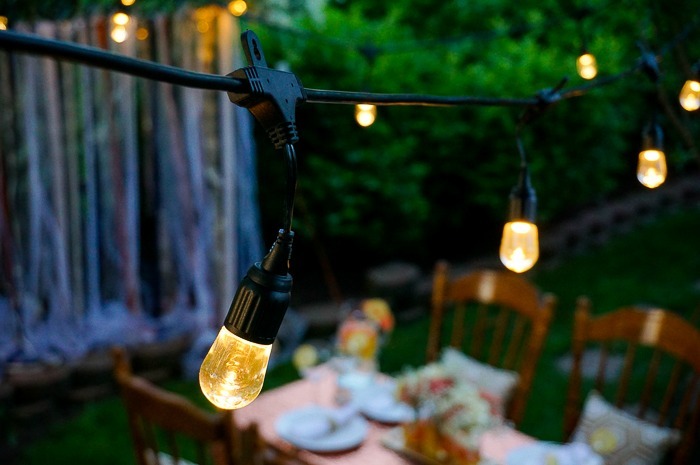 These lights make hanging very easy in lots of settings because it has a spot on every few lights that will allow you to run a twisty tie through it or hang it on a nail or hook of some sort. For the table, I used a light weight plastic table that I love for outdoor set ups. Once you add linen, you wouldn’t know a difference. But for the chairs, I just can’t bring myself to set up a gorgeous outdoor dinner party under the stars with folding chairs. It is a detail that makes all the difference in my opinion. Tip: Plastic wrap on the bottom of chairs to keep them clean. While I wasn’t worried about the chairs being ruined by being in the yard, I wasn’t clean up to be as quick and easy as possible. By taking 5-10 minutes to add a little plastic wrap with rubber bands to the bottom of the chairs, I kept all dirt off the chairs. 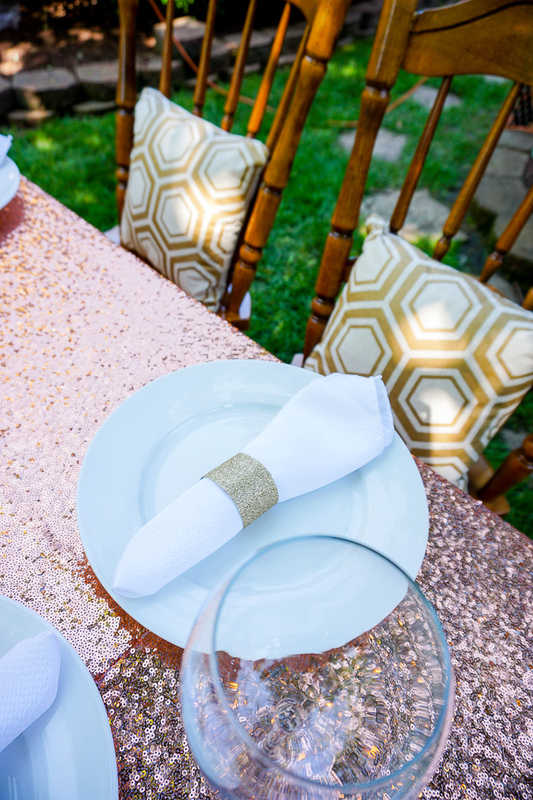 For an outdoor dinner party, pick only a couple key textures and fabrics to add to the table. There is no need to go overboard, especially when you want the outdoors and landscaping to be a primary focus. 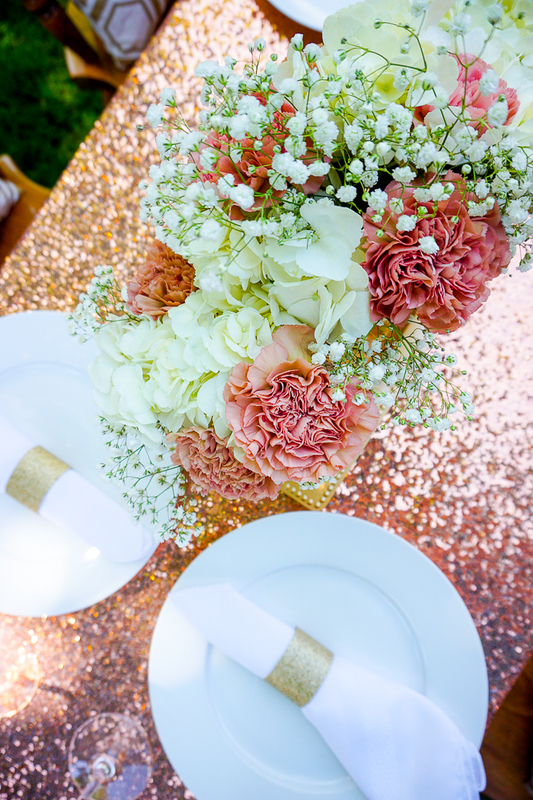 For me, I chose a sequined rose gold table cloth that I had already and love. It offered a beautiful contrast to the green in the backyard. I then decided to also add a few touches of gold as well, adding gold glitter paper napkin rings, a gold tray to hold the flowers, and gold and burlap outdoor pillows. If you have some extra time or one laying around, I suggest adding a whimsical backdrop to your event as well. In this case, I used a ribbon garland I had made previously for a bridal shower by tying or glueing ribbon to twine. It adds additional softness plus it makes a great photo backdrop if you want to take pictures with your friends. 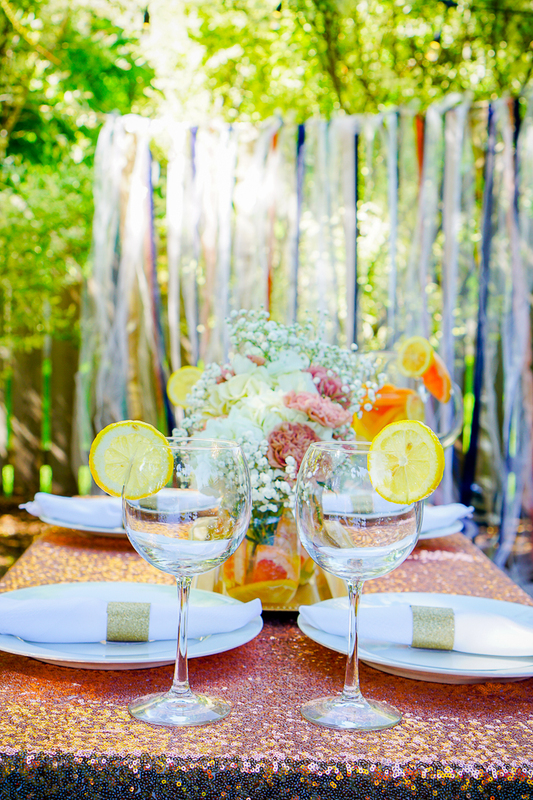 You could get a similar look by using a plastic tablecloths in colors of your choice, stapling them together at the top and then cutting into strips. I am not normally one to spend money on fresh flowers. While I love them, they don’t normally add into my budget for how long they live (plus I have a horrible brown thumb). However, for a party, flowers are a must! Simple flowers – here I used carnations and baby’s breath – make a big impact! We have so much beautiful fruit at our disposal to use for a party, especially in the summer. 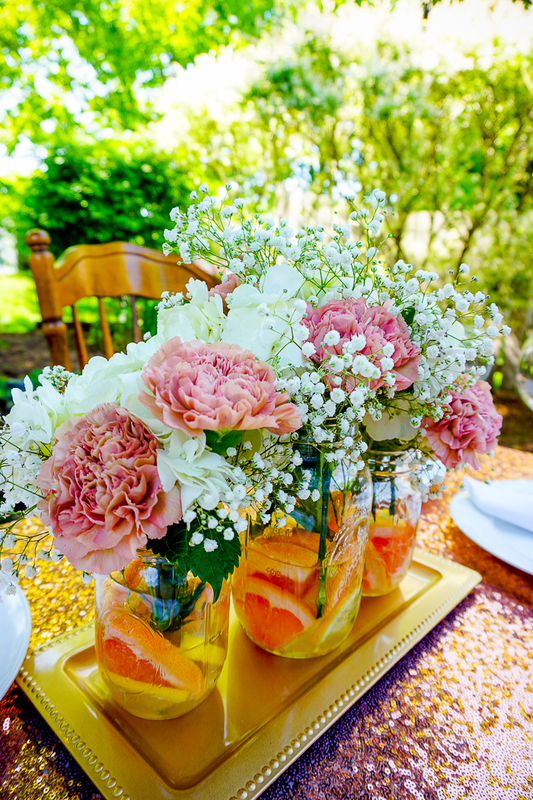 I chose grapefruit and lemons in this case because they paired so well with the rose gold tablecloth. 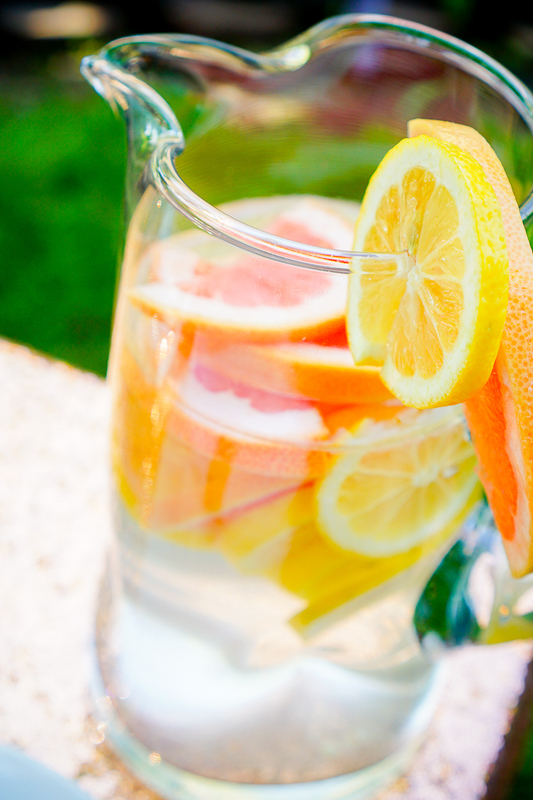 I added the fruit to the flower jars for a special touch and then to a pitcher of water which was a big hit! Find or make candles that are great for keeping bugs away and add to the table or in the surrounding area. Just make sure you put candles in a safe place where nothing will watch the flame. I love my Enbrighten Café Lights by Jasco that I am helping them host a giveaway for all of you! You can win your own set so you can start creating your own summer evenings with the perfect lighting. I don’t know why, but I can just picture this space as a small private wedding celebration, I just love the strung lights and that glitter tablecloth is perfection!